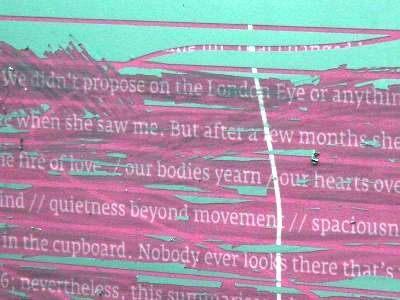 Commuters on a busy walkway alongside the Royal Festival Hall will be able to read love messages whilst they are serenaded by Mark-Anthony Turnage’s latest composition. The new installation is the latest in a series to brighten a popular commuter route alongside the Royal Festival Hall linking the Golden Jubilee Bridges and Belvedere Road. 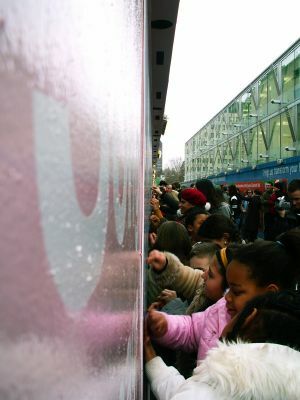 The installation contains hundreds of love messages written by Londoners, hidden behind a silver film – the same material and technique as scratch cards. Visitors to the South Bank walking past the installation will be encouraged to scratch away the silver to reveal the poems and messages, while being serenaded by excerpts from Mark-Anthony Turnage’s composition Hidden Love Song. The installation is a collaboration between the South Bank Centre, the London Philharmonic Orchestra, Central Saint Martins and two primary schools in Lambeth and Kent. Poems and messages, some anonymous, tell the true stories of unrequited love and chance encounters. Mark-Anthony Turnage has contributed his own message; his composition was written in secret for his fiancée and inspired by WH Auden’s poem Lay your sleeping head my love. “We hope to bring some romance to London’s commuters with this installation, which cleverly brings together three different art forms and organisations,” said Jude Kelly, artistic director of the South Bank Centre. Created by Arlete Costelo and Melissa Mongiat, students on the Narrative environments MA course, Central Saint Martins College, the 20-metre installation helps to brighten the area around the Royal Festival Hall building works. The hidden love messages will be gradually revealed in the lead up to St Valentine’s Day.